Cables have outer insulating jackets as a means of preventing water or moisture from getting into the cable. Water needs to be kept out because it creates noise on telephone lines and potential faults on power cables. The main problem is not that the water itself causes electrical failure – the internal conductors of the cable have their own insulation which should prevent this – but that ground water is frequently slightly acidic. This acid may eventually damage the insulation of individual conductors. The actual fault caused by water in a cable may be found by any of several techniques such as impedance bridge measurements or Pulse/Echo (TDR) techniques. These will find the faulty conductors and enable repair of the service but may not find the actual cause of the fault. If a fault is caused by moisture ingress through the outer jacket to the sheath, the actual fault may occur some distance from the sheath fault because water runs along the cable to a local low-point; the electrical fault is found at the low point rather than at the sheath fault. Finding and repairing a sheath fault is sensible preventative maintenance which may reduce recurring faults. A sheath fault is often caused by physical third-party damage to a cable and often accompanies other damage internal to the cable. Radiodetection locators can find sheath faults. The sheath is intended to be insulated from ground (except at deliberate terminations) so the FFL’s function is to find the point where an otherwise insulated conductor is in electrical contact with the ground. The principle is based on the direction of flow of ground currents. 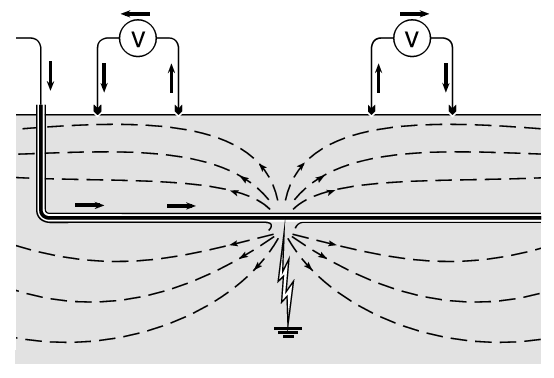 Consider a battery connected across a faulty sheath and ground and all deliberate ground/sheath connections removed, the path of the current flow will be along the cable sheath to the fault, through the fault to ground and then through the ground back to the other terminal of the battery. 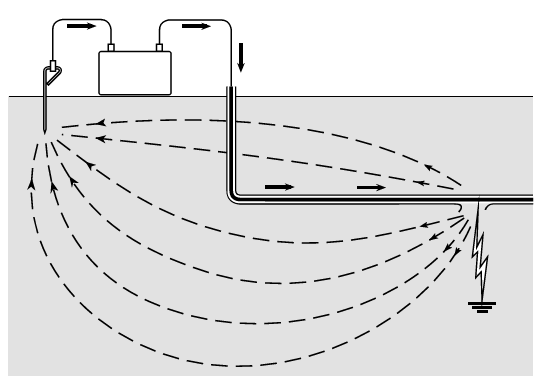 At the sheath fault, the current is ‘escaping’ to ground and will immediately spread out and return to the battery via many different routes. 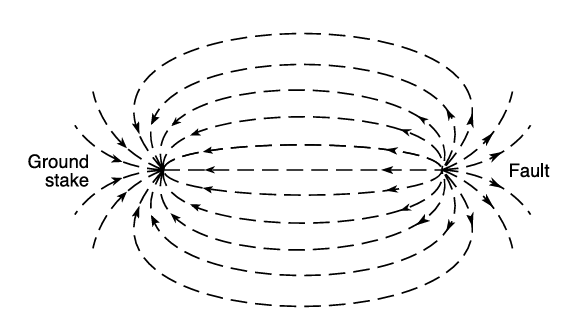 The current can be pictured flowing out of the fault in every direction so that in the vicinity of the fault the ground currents on the surface radiate out from the fault like the spokes of a wheel. 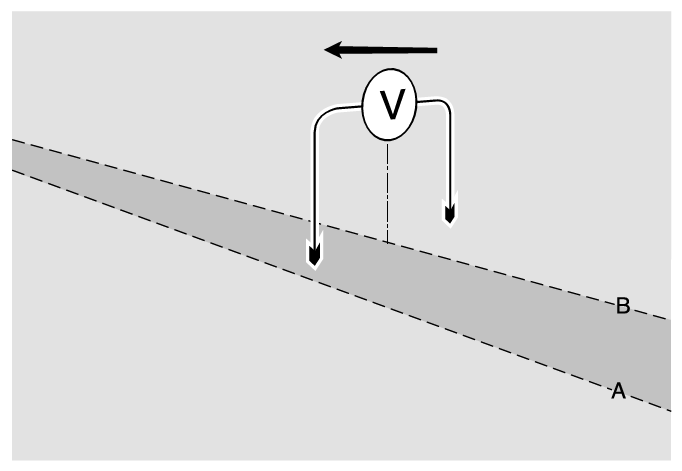 If a voltmeter is connected to the ground at two points, as illustrated, it will display a positive reading or a negative reading, depending on the direction of flow of the local ground currents. Note that the ground currents are concentrated in the area of the ground stake and the fault, and are very much more spread out in the area between the two; this corresponds to the signal strengths which will be detected - strong when close to the fault and weak or non-detectable when distant from the fault. 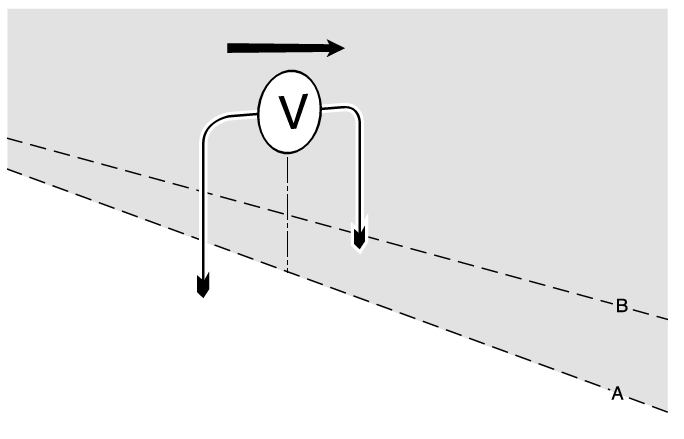 The polarity (negative or positive) of the meter deflection then shows whether the sheath fault is ahead or behind the position of the voltmeter.Note that the meter does not indicate directly the direction of the fault. Imagine a line drawn through the centre of the meter, the meter deflection indicates which side of the line the fault is. If the meter is moved along in the direction of the fault, it will eventually flip over and point in the opposite direction. The line of the fault is now known; it must be somewhere in the narrow strip defined by the two overlapping areas. All that is required to home in on the exact fault location is to turn the meter through 90 degrees and search along the defined narrow strip until the meter again flips. 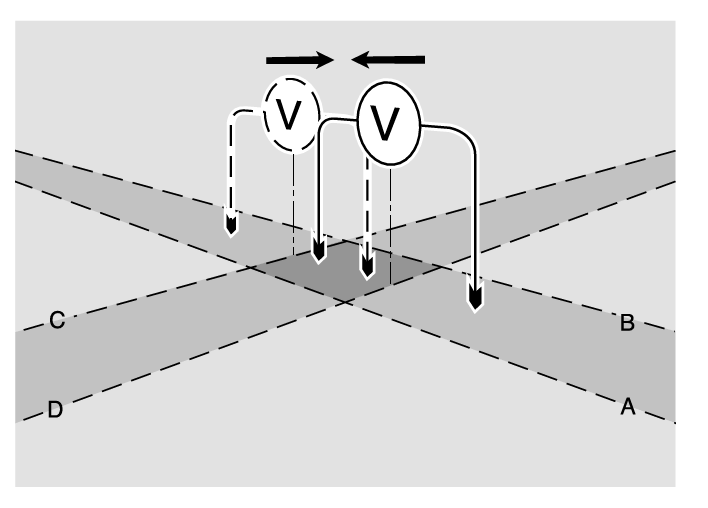 Turn through 90 degrees again to zero-in exactly (thus allowing for the curved path of the ground currents) and soon a point is reached where any movement of the meter in any direction causes the meter indication to flip. The position of the fault is then isolated to within a few square centimetres/inches. The principle of operation is the same as described above except that it does not use a DC source. In practice, the battery idea does not work because of stray naturally occurring ground currents overpowering the weak fault current. Instead, AC signals are used. The FFL’s circuitry is able to decode the information contained in the signal in order to display its relative direction of flow. Try connecting the FFL transmitter’s leads backwards - the FFL receiver will respond with a meter response that points away from the fault.